Greenland Beekeepers' Association in Narsarsuaq has received half a million bees. The purpose of the bees is to make honey for the whole country. It is a consignment of healthy Nordic brown bees from Sweden, says an optimistic beekeeper-chairman. - The bees will be used for the production of honey. We have done so for some years, but we would like to produce something more. It has been attempted twice before putting bees in South Greenland. The first time for approx. 12 years ago, where the bees were fewer and fewer, in the end there was only a few left. Ole Guldager thinks its had something to do with the Queen. When a queen dies in other countries, you call you to the nearest queen breeder and then you get a new queen in the mail the next day. It can't be done up here. The beekeepers themselves make the colonies, and if it can not be done, then the families dies. adds Ole Guldager. - We simply need have a few more hives in order to build the foundations stock. 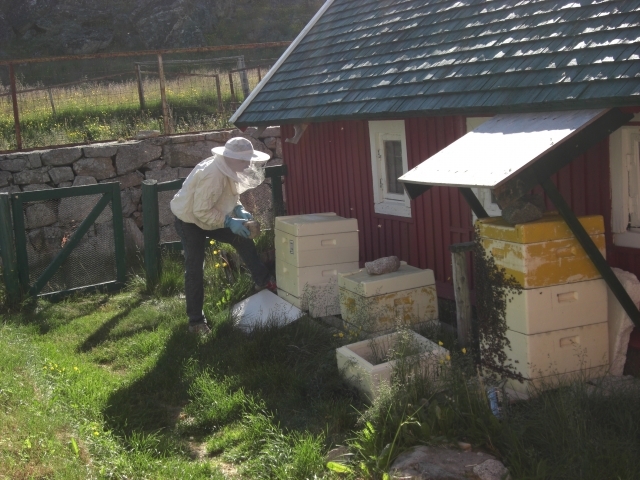 We have also distributed the bees to several locations, both in Narsarsuaq and Arsuk areas. Therefore, there is now half a million extra bees in Narsarsuaq in total10 families. Ole Guldager hopes to have the number up to 20 in the fall. The new consignment of bees Nordic brown bees from northern Sweden, is different than the bees that were put out 5 years ago. - There some pretty good bees for us in Greenland, they are adapted to a cold climate and should thrive in Greenland. But because they are a little different than the bees we have at present, we are in the process of replacing all of our existing queens so that we get the same basic stock of Nordic brown bees. And there is not much that can go wrong with the new bees, predicts Ole Guldager. These bees are disease-free so can not spread anything naturally when they need hollow trees if they are to make hives. - There are in control. Ole Guldager hopes that more of Greenlanders will be interested in beekeeping. He believes that you can practice beekeeping virtually the entire west coast up to Disko Bay.